Dengeki PlayStation has a few more tidbits with the upcoming Atelier title, Atelier Escha & Logy: Alchemist of Dusk Sky, featuring details on the new battle system and introducing three new characters. Slayer Hazelgrimm (スレイヤ・ヘーゼルグリム) (CV: Chiharu Kitaoka) – 26 years old, B blood-type, 167 cm. Historian. A young lady with a nice body and either silver or white hair. She wears a shirt, jacket, and necktie over a black slip and skirt with a slit in it. A specialist in the field of historical inquiry, she has a bit of alchemical knowledge from her study of relics from the period of prosperity. She can handle dangerous field work with ease. Her weapon is an earring, which she uses as a catalyst for her special “analysis” power. Rafer Ruckberry (レイファー・ラックベリー) (CV: Yasunori Masutani) – 32 years old, AB blood-type, 178 cm. Treasure hunter. Cowboy-esque. A young guy with blond hair and a beard. His weapon is a top break revolver. He’s a treasure hunter who wanders the world. He hits it off with the explorers of the ruins, and is himself tackling an excavation. He pokes his nose into anything that seems interesting. Up to six people can participate in battle. Party can use support moves as much as remains in the lower right gauge. When your allies use chain attacks, the damage amount increases, so tactical importance will be placed on combos. The way they recorded was different from doing anime since one person’s lines are rounded up and done at once. Escha and Logy have a brother-sister-like relationship. The set-up for the end has to do with Logy’s past. 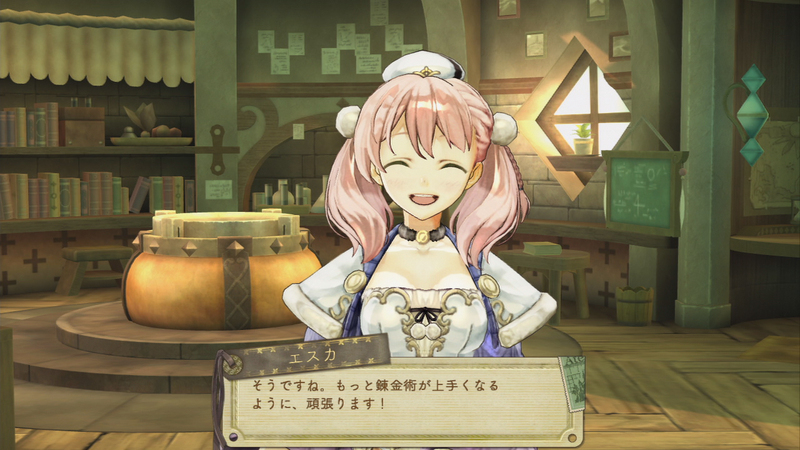 There is a memorable scene where Escha gets emotional with Logy. The funny scenes are funny to a worrisome degree. There’s going to be a NicoNama streaming show. Concerts have also been slated. Atelier Escha & Logy: Alchemist of Dusk Sky (エスカ＆ロジーのアトリエ～黄昏の空の錬金術士) ～ Esuka & Rojii no Atorie ~Tasogare no Sora no Renkinjutsushi~ is set to release in Japan on June 27 of this year.